If you’re like me when I first started learning calligraphy, you look at people who appear to “effortlessly” add flourishing to their work, and start having a mild panic attack. Every time you try to flourish, it looks like a your six year old niece did it. Right? Yeah… I feel you. Trust me. I was there. I avoided flourishing for sooooo long before I decided to just jump in and figure it out. Turns out that was actually the best way to learn- JUST DO IT. Just jump in, start playing around, and do it. But…lets be honest. “Just do it” is the most annoying advice ever. Like, seriously? Those three words are so unhelpful when you’re looking for concrete advice on where to start. So instead of writing a blog post that tells you to “just do it”, and leaves you with no more skill than you had when you got here, I’ve actually compiled a starter cheat sheet for you. But first, let’s back up a bit. What if you don’t even know what flourishing is?! 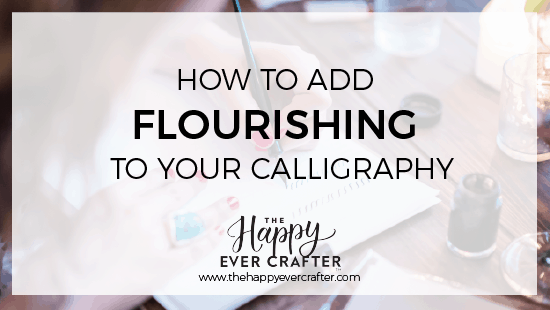 Flourishing is basically just a fancy term for “decorating your calligraphy”. Minuscule t’s and y’s are pretty common spots to add flourishing. But… how do you know how to make/add these shapes onto your letters? Well, we talked about this. Common advice would tell you to “just do it”…. just play around and figure it out. However- if you know me, you know that I am a much more methodical person than that. Over the past few years of learning calligraphy, I’ve pinpointed some styles of flourishes that I see commonly, and I’ve spent time studying them and reproducing them. I have filled pages and pages and pages of random swirls and swooshes- not even attached to any letters at all. And I’ve found that just the very act of drawing the shapes has completely built up my muscle memory and my ability to actually add them to letters later on. So I want to share a page of those swooshes and swirls with you. I encourage you, if you want to learn how to flourish, to play around with this practice sheet using tracing paper with a monoline pen or a pencil. And once you’ve traced over it a few times, try doing it freehand. Then once you’ve done that, start exploring with your own swirls and swooshes! Fill as many pages as possible with your flourishes, completely unconnected to letters at all. I promise- this exercise is both fun and helpful. Yay!!! So excited for your next workbook and that it’s flourishing 😊👏🏼👏🏼👏🏼 I just love your workbooks, I feel like I’ve learned so much from you. Thank you! This is one of my more difficult areas! I soooo love the freebie! 🙂 Thank you so much Becca! Thank you for sharing! !!! So enjoy your site! !!! You are killin’ it, girl. Thank you for the worksheet. Thank you so much for sharing all of your incredible tips and information. Just found your site. Where can I find your flourishing workbook?